Seven years ago on March 28, 2010, Congress let the National Flood Insurance Program expire and left Washington for a two week Easter vacation. This reckless action could have been disastrous for Nashville and the 20 inches of rain that fell on May 1, 2010. With more than 10,000 structures damaged by the flood waters in Nashville, our recovery (without insurance) would still be going on today. Our representatives seem to take a nonchalant attitude towards this program for many years. Occasionally letting it expire without any long term plans to correct the problem. Once again we face another deadline at the end of September 2017. Congress has had five years to make changes and re-authorize the program. Instead, they decided to play kick the can. Fortunately, the National Association of Realtors has been leading the fight for homeowners on this issue. The Realtors are currently holding a Call to Action urging Congress to pass several pieces of legislation relating to the re-authorization and reformation of the National Flood Insurance Program. For the past week, thousands of Realtors across the nation have been urging their representatives to take action on these bills. This weekend’s destruction in Texas due to Hurricane Harvey should be a wake up call for our government. But we can’t guarantee this disaster will spur them to pass this legislation, and I am asking for your help. Please reach out to your representatives and ask them to pass HR 2874, The 21st Century Flood Reform Act. This act will re-authorize the program and increase funding for mitigation, cap overall premium increases, improve claim and mapping processes, and remove hurdles for private flood insurance programs. 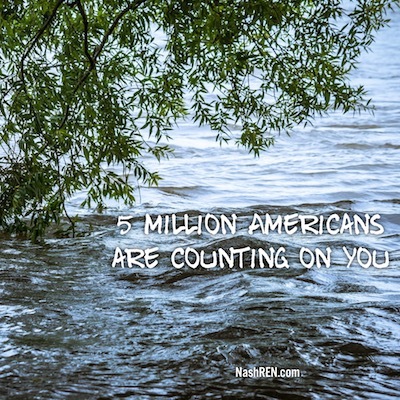 Five million Americans in 22,000 communities are counting on your support. How do you reach your representatives? Call me at 615-519-0983 and I’ll help you. The Daily Deal in Nashville is a great starter home in a very convenient location in Hendersonville that is listed for less than $215,000.